Journalist Anna Politkovskaya was assassinated on Oct. 7, 2006. This coming Wednesday, a memorial rally is scheduled to take place outside Chistyye Prudy subway station in Moscow. 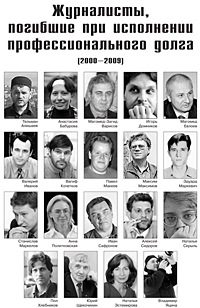 It's been three years since the day of Anna Politkovskaya's murder; those who ordered and carried out the killing are still at large. Aleksey Simonov [president of the Glasnost Defense Foundation], Ilya Politkovsky [Anna Politkovskaya's son], Dmitry Muratov [Novaya Gazeta's editor-in-chief], [actress Liya Akhedzhakova], Grigory Chkhartishvili [a writer, aka Boris Akunin], [human rights activist Lyudmila Alekseyeva], [politician Grigory Yavlinsky], [politician Boris Nemtsov], [actress Chulpan Khamatova], [politician Mikhail Kasyanov], [satirist Victor Shenderovich], [journalist] Yulia Kalinina, and others. The rally will begin at 4:03 PM sharp. The rally has been sanctioned by the Moscow city authorities. "ANNA - Oct. 7, 2006: The killers are still at large." And who is the killer and who ordered it? Maybe he's already dead? I'm horrified to see this unimaginable iconostase. I'm horrified to think of whether the number of the participants of the rally will at least be no less [than the number of the people pictured on the poster]. Have they died in vain? Looks like they have. "I'll be there." Is that where Politkovskaya is now? Don't hurry too much, you know. We'll all be there one day. I'm talking about the rally. Why would you bother? You'll make some noise and disperse - will it change anything? But if we don't make any noise, there'll be no changes for sure. Don't forget to post a photo report. Eh, I love taking walks on Chistoprudnyi [Boulevard, the site of the upcoming rally and of a number of other rallies held by the opposition in the past]. But now I have to browse the internet before each walk, to check if some [idiots] are planning to gather there for a rally (though, for some reason, the same ones are protesting there all the time). [Haha], why have you signed up Stasik Markelov as a journalist? Wasn't he a lawyer? Or is [anyone] fit to be an extra? Then go catch them [Anna Politkovskaya's killers]! If they are at large, why don't you catch them or pass the information about them to the police!